St Kitts is more formally known as Saint Christopher island and was named by Columbus after Saint Christopher the patron saint of travellers along with its sister island Nevis, is the smallest sovereign state in the Western hemisphere both in terms of area and population. As with many Caribbean islands St Kitts has a history of disputed ownership between the Spanish, British and French and a sad history of slavery and persecution of the indigenous Indian populations. Nevertheless, it achieved full independence in 1983 along with Nevis although they were historically governed as separate states until the late nineteenth century. Tourism is now the chief industry on the island though historically it was a major centre for the sugar cane industry which lasted longer on Saint Kitts than many of islands close by. The remains of the sugar cane industry can be seen with windmills throughout the island as well as luxury ex-plantation hotels. Today it also is a centre for education with many American Universities having campuses on the island and it has also encouraged tourism and investment through its citizenship programme. Saint Kitts has a varied geography stretching from the golden sand beaches and resort hotels of the southern part of the islands, through to the mountainous, rain-forested central areas and the sweeping plateaux of the eastern side of the islands. On the western side of the island is the UNESCO World Heritage Site at Brimstone Hill and the now crumbling Fort Charles. St Kitts is also rich in natural fauna and flora and is home to troupes of chattering vervet monkeys which you might see up in the trees throughout the island. Saint Kitts also has a rich sporting heritage with Kim Collins, who has won gold medals in the 100 metres at the World Championship in Athletics coming from the island. Saint Kitts is also the smallest island to host a World Cup match, whilst the national football team (known as the Sugar Boyz) progressed to the semi-final round of qualification for the 2006 CONCACAF World Cup region. 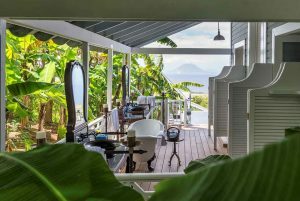 Belle Mont Farm is nestled amongst 400 acres of fertile, organic farmland and lush tropical forest on the island of St. Kitts in the West Indies and transformed into authentic culinary experiences in their restaurants. Belle Mont Farm is committed to sourcing as much as possible from the land, forest and sea that surrounds the hotel. We work closely with sustainable farms and nearby suppliers who share their desire for responsible fishing, farming and animal husbandry, to provide you with whatever we can’t produce ourselves. They also cooperate with local community farms to reduce the island’s need to import fruit and vegetables. Your accommodation at Belle Mont is designed by the award-winning architect, Bill Bensley, whose designs regularly feature on the cover of Conde Nast. Bill’s designs for Belle Mont Farm have been crafted in harmony with the natural landscape and feature spectacular views of the ocean and forest that will fill you with a sense of space and openness that refreshes the spirit. Gaze at the verdant forests, which blanket the slopes of Mount Liamuiga and descend to the Caribbean Sea from your private wrap-around veranda. The St Kitts Culture House offers a more basic option for you in the South of St Kitts. 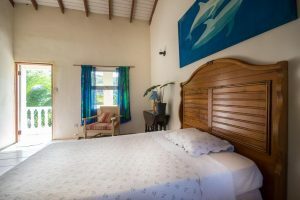 All the rooms here are spacious and have their own en-suite bathrooms and private balconies overlooking the ocean and tropical gardens in which grow 21 rare fruit trees. The hotel also has its own restaurant and beach bar which regularly hosts acts from bands around the island. The hike starts in agricultural land at the base of the mountain and begins a gradual ascent. Upwards, you walk through a lush tropical rainforest passing giant tropical trees with vines snaking around their branches, and a profusion of beautiful flowers. Before reaching the summit, you walk through a misty, dream like cloud forest and notice how the vegetation changes from a tropical to a mossy forest. 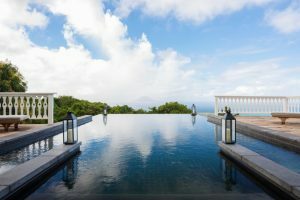 At the top, on a clear day, you can admire far-reaching views across Saint Kitts and to the neighboring islands Saint Eustace and Saba. You can also get a clear view of the Devil’s Tooth the tallest point on the crater. 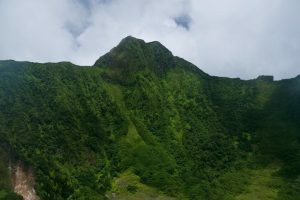 This hike enables you to explore the beautiful South East Coast of St Kitts where a series of interlinked hills, beaches and bays lead from the central part of the island to its Southern tip. Parts of the area of still virgin forest and scrubland whilst some has been given over to luxury developments of hotels and apartments. 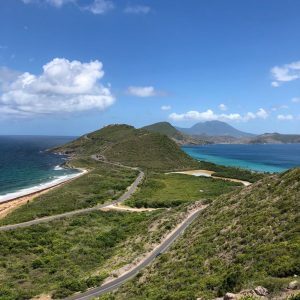 All along the way though are beautiful beaches where you can stop to bathe or for a rum punch and the higher elevations offer amazing views not of St Kitts and across the short two miles stretch to its sister island of Nevis. This trial runs near to Mount Liamuiga in the North part of the island. It starts as part of the old military trial built to cross the island from the Atlantic to the Caribbean side. It takes you up over two hills covered in verdant green tropical trees. After this you follow a natural waterway up to the summit of a third mountain. Here is the crater of an extinct volcano a small waterfall. You can swim in the lake if you want although it might be surprisingly cool given the altitude and the likely cloud cover. The downwards route can be harder than uphill as it is often muddy and wet and you need to be careful keep your footing. This short hike covers an area with a sad history. During the colonial period there was a massacre of some 2000 Carib Indians by French and English forces in 1626. The amount of blood let apparently caused the river to run with a red colour hence the name. The site shows evidence of Indian occupation going back thousands of years and there are petroglyphs which can be seen on the walls of caves (as well as lots of bats!). The hike starts and finishes in the village of Challengers on the Caribbean coast and you also get an insight into local village life. We have a wide variety of alternative trips to offer on St Kitts for those who don’t want to hike or want to rest their legs for the day. The Pirates of St Kitts tour focuses on pre-colonial history with sites which were important to Carib Indians given St Kitts was a hub for their activity in the region. Forts, Strongholds and Look Outs looks at the evidence of colonial defenses across the island including the UNESCO World Heritage site of Brimstone Hill. We can also arrange tours which focus around St Kitts connection with Lord Nelson and the American founding fathers Thomas Jefferson and Alexander Hamilton, and on the production of sugar cane and rum on the island. 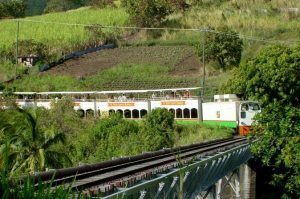 In addition to the tours which focus on the different aspects of St Kitts’ past you can of course enjoy more modern activities including mountain biking or a trip on St Kitts scenic railway in the North of the island.